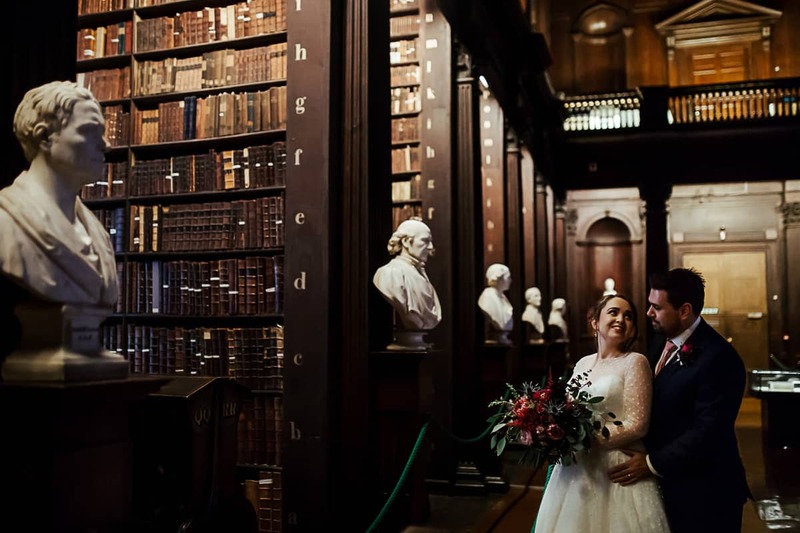 Dublin city weddings are definitely unique! Among tourist crowds and passers by there are so many cool and quirky spots. Depending on what you love the most about Dublin you can show parts of it or all of it – but there’s definitely something for everyone. 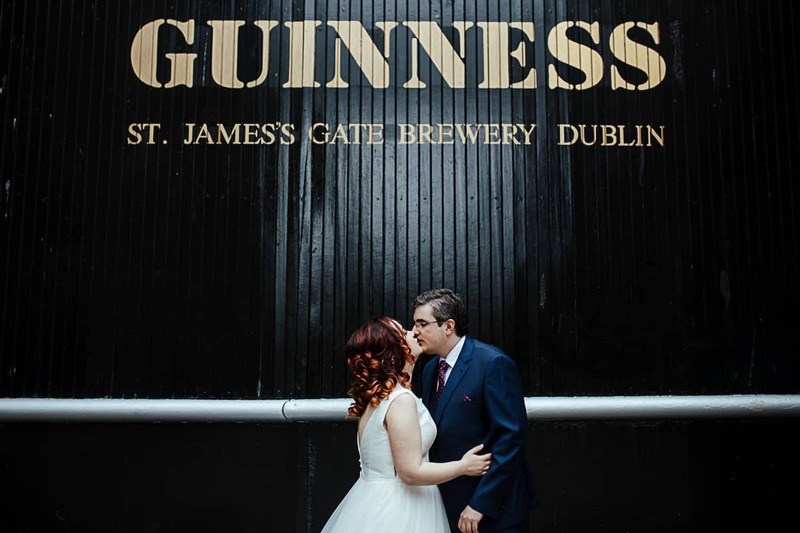 Below are some of my favorite locations for wedding photos in Dublin! You can’t imagine a more iconic Dublin park. St Stephen’s Green is recognizable in every photo and beautiful in every season. There are cherry blossoms in spring, greenery and swans in summer and the most gorgeous colours in autumn. If you don’t mind having a few passers by in the background, it’s one of the easiest locations for wedding photos in Dublin. Don’t forget to notify the OPW and apply for a permission before your big day – they grant it with no questions asked. A less known spot a stone’s throw away from St Stephen’s Green, Iveagh Gardens is quieter and more intimate. Yet it’s one of the best locations for wedding photos in Dublin if you want a little oasis of calm in the middle of the city. It even has a magnificent fountain. The schedule of when it turns on is Dublin’s best kept secret. But you might just get lucky and get this magnificent cascade as your wedding photo backdrop! 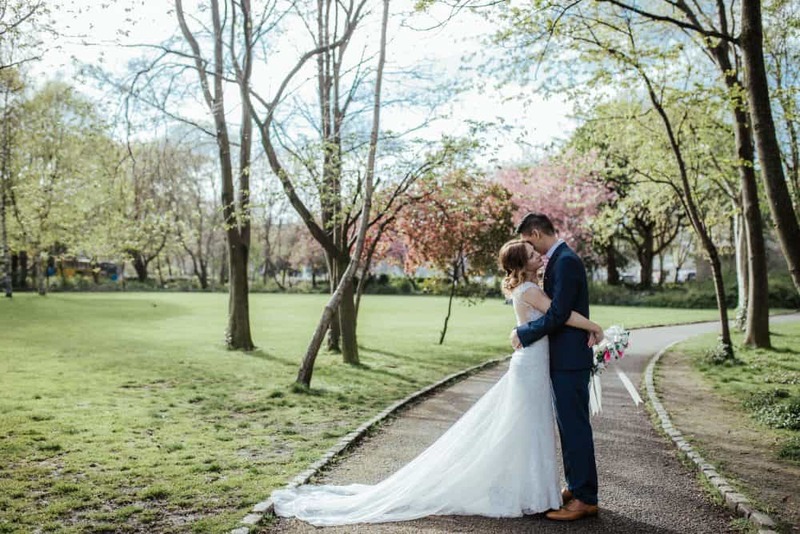 Situated in a historical and classical part of Dublin, Merrion Square is perfect for classy and elegant wedding photos. It’s magnificent in spring with cherry blossoms casting pink shadows. There are also some inspiring old trees. You can always combine it with a few photos around Dublin’s classical Georgian buildings or the National Gallery of Ireland. One of my favourite locations for wedding photos in Dublin, Trinity College is only accessible for those who can call it alma mater. But if you or your partner went to Trinity, the opportunities are endless. From the iconic and unique Trinity College Library to the Museum Building, from the quiet Rose Garden to the classical columns. It’s also a great hide-away on a cold or rainy day. If you have a chance to get your wedding photos there, don’t miss it! Dublin’s South Side has a lot of cool street spots, so if the urban scene is your cup of tea the photo opportunities are endless! 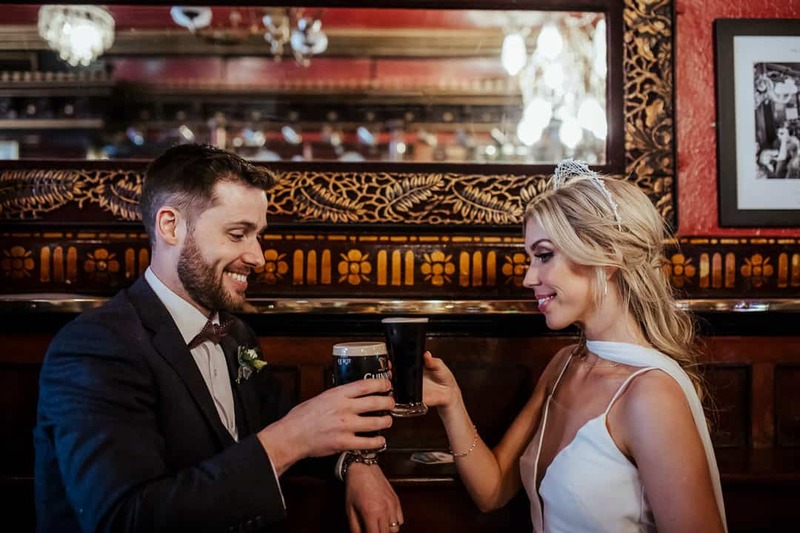 I haven’t included the Temple Bar in the list because of how busy it always is (though it’s perfect for an elopement or engagement shoot if you don’t mind going there in the morning!). 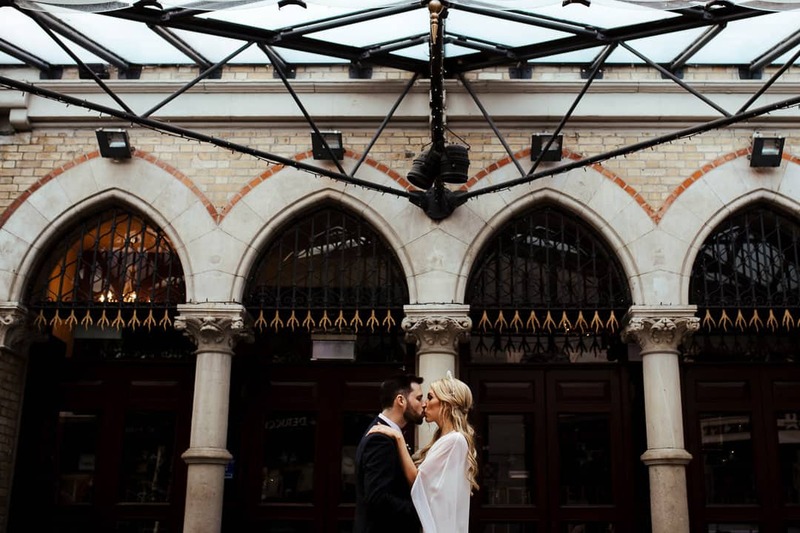 The area south of Dame Street is the perfect location for wedding photos in Dublin. 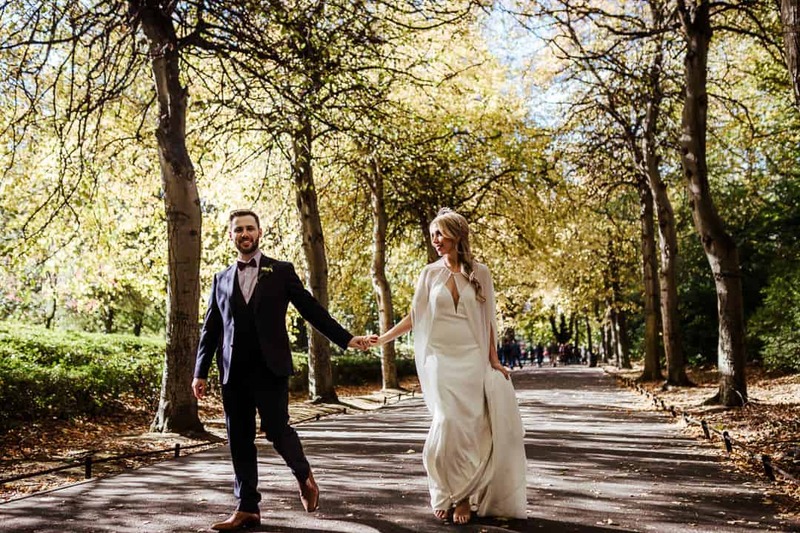 It’s lovely to stroll around familiar spots wearing your wedding dress – it makes Dublin look and feel so different! After a nice stroll around Dublin pop into an iconic pub for some truly Irish photos. The Stag’s Head on Dame Lane or The Long Hall on George’s Street have amazing interiors. Try to grab a seat by the window to soak in the day and watch the world go by as you prepare to spend a lifetime with your favourite person in the world. Brick walls, cobblestone streets and the smell of barley. This iconic spot is one of the best locations for wedding photos in Dublin if you want something different. 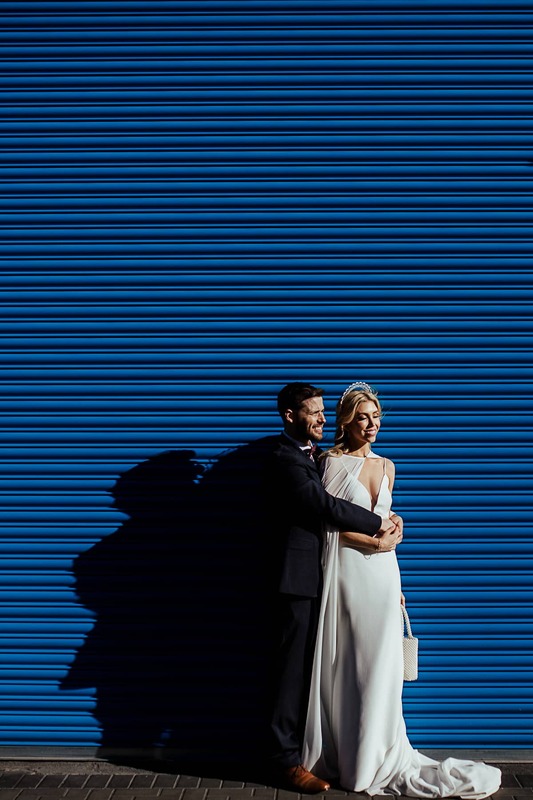 I love the way the dark tones of the rough buildings contrast with the whiteness and elegance of wedding dress. It’s a bit out of the way but Guinness Storehouse is definitely worth a trip. The area around St James’s Gate is always relatively quiet, so you needn’t worry about flocks of tourists invading your wedding photos! 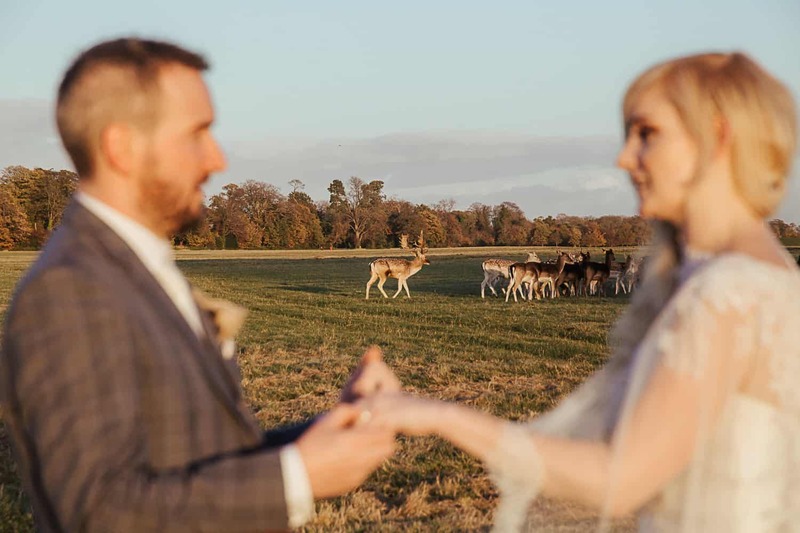 A real oasis in the middle of the city, Phoenix Park is the perfect location for wedding photos in Dublin if you want to feel like you’re away from the city! The area is so vast that you can truly feel alone together. Some of my favourite spots there look like a forest in the middle of the country. If you’re lucky you’ll even spot some deer in the background! 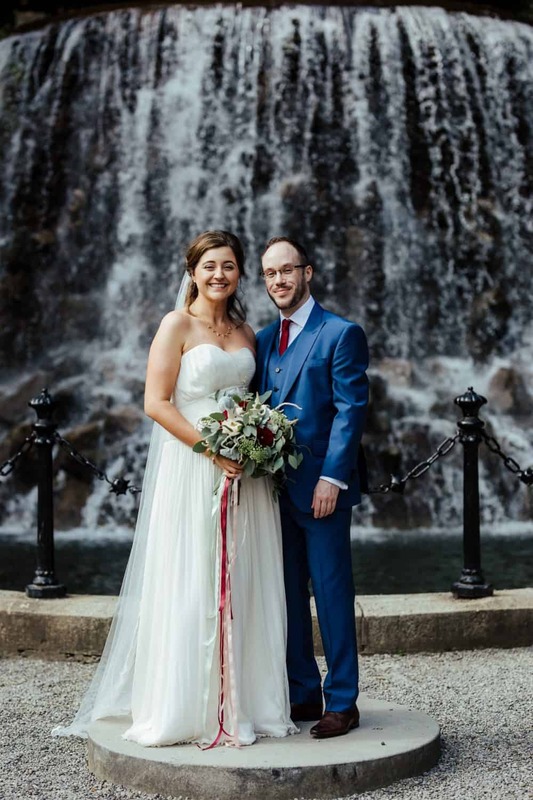 LOOKING FOR A DUBLIN WEDDING PHOTOGRAPHER?